We will do our best to accommodate your busy schedule. Request an appointment for a contact lens or eyeglass fitting today! 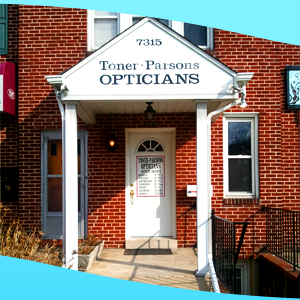 Toner-Parsons Opticians of Baltimore, MD is family owned and operated since 1928. Our knowledgeable staff and shop are dedicated to producing quality eyewear and servicing each individuals needs. Our staff of ABO certified opticians is here to provide personalized attention and custom service. We specialize in difficult eyeglass prescriptions, optical challenges, problem solving, frame adjustment, frame repair, and product selection. We accept many different insurance programs. Please call or email for additional information. Contact Toner-Parsons Opticians today at 410-444-4737, or browse the website for more information about our products and services. Check out our Facebook page for all our other current sales!